Artist’s Reception: Friday, August 19, 2011, 5:00 – 9:00 p.m.
Gallery Talk: Sunday, August 21, 2 p.m.
Catalogue Signing: Sunday, August 28, 2 – 4 p.m. Weekdays, 11 a.m. – 7 p.m.; Sat., 11 a.m. – 5 p.m.; Sun., 1 – 5 p.m.
SEE THE TV INTERVIEW HERE. 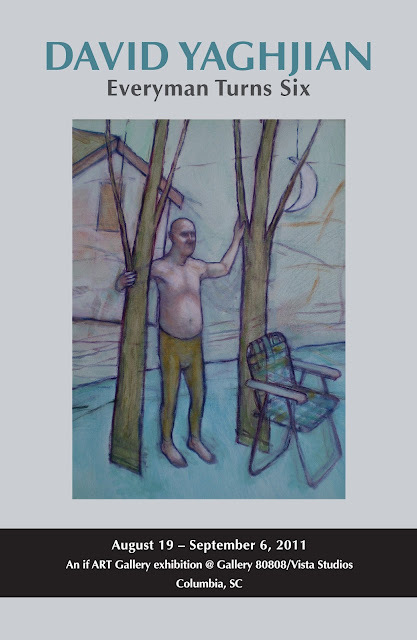 Six years ago, Columbia artist David Yaghjian painted a guy in underwear resembling himself, twice, for a fundraiser around the theme “Fool for Art” for the University of South Carolina’s McKissick Museum. The two paintings triggered a new body of work, often dubbed the “Everyman” series, which Yaghjian has pursued ever since. The often loosely rendered paintings are a dramatic change from the usually precise paintings of urban landscapes and architectural structures that Yaghjian was known for, although not a total break, as the catalogue essay by if ART Gallery owner Wim Roefs argues. if ART Gallery will open an exhibition of six years of Everyman paintings at Columbia’s Gallery 80808/Vista Studios on Friday, August 19. The exhibition will run through Tuesday, September 6, and present some 100 “Everyman” paintings and sculptures by Yaghjian of the past six years. The opening reception is August 19, 5 – 9 p.m.; the gallery talk, August 21, 2 p.m.; and the catalogue signing, August 28, 2 – 4 p.m. The 40-page catalogue is in full color. The catalogue contains an essay, an extensive chronology of Yaghjian’s career, 57 color images of his work of the past 40 years and the checklist of the exhibition. A low-resolution version of the catalogue is attached. Going with the flow of his imagination, emotions, free associations and hand and brush, Yaghjian has created a figure whose trials and tribulations he catches in symbolic and metaphorical, psychologically pregnant scenes that excel in ambiguity. Some of the paintings express joy, humor and elation, others are contemplative, angst-ridden, dark and disturbing, and many combine opposite emotions. The Everyman paintings might indicate Yaghjian’s arrival as a mature artist, producing the most inspired, sophisticated, distinctive and unique work of his 40-year career. The work also has taken him beyond the canvas, creating sculptures from cutout cardboard or wood. Everyman gives Yaghjian both conceptually and artistically the most productive vehicle to date to engage himself and the world.